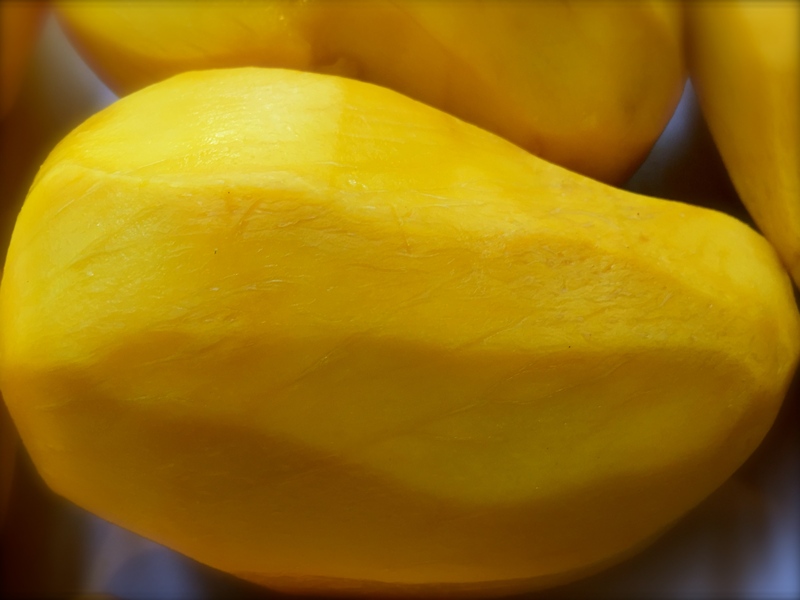 Mangos are my absolutely favorite fruit! I could eat them every day. The tastiest ones I’ve had are the Kent and the Champagne varieties. When perfectly ripe, both are sweet and without stringy fibers. They feel silk-soft and velvety on my tongue. Last weekend, I was the lucky recipient of three boxes of free mangos. Thank you Austin, for thinking of me. The fruit was quite ripe, some of it almost too ripe. 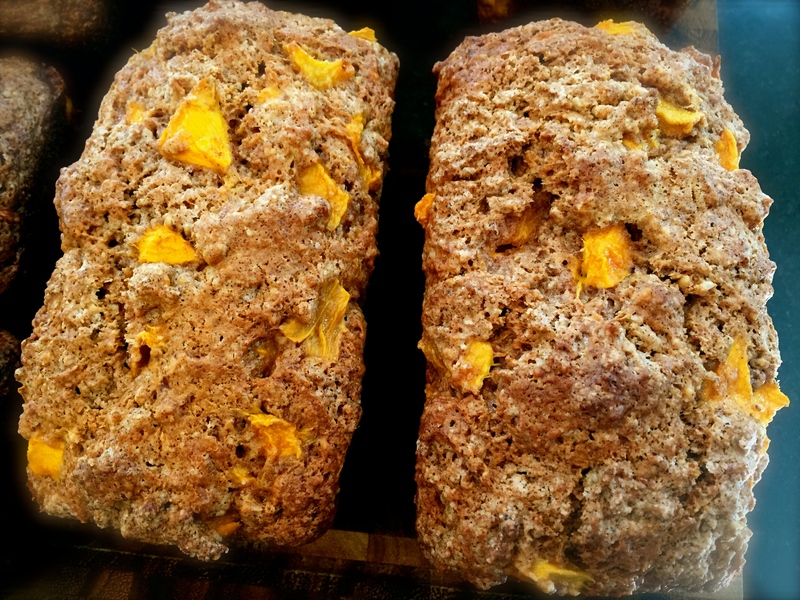 However, it was perfect for making a batch of golden mango butter and several loaves of Mexican Mango bread to share with friends. For the mango butter, I peeled and chopped about 12 mangos. I put them into a large pot, added enough fresh lemon and orange juice to cover the fruit. Once it came to a boil, I simmered it for about 45 minutes, pureed it with a immersion blender and continued to cook it, until the liquid was mostly reduced. 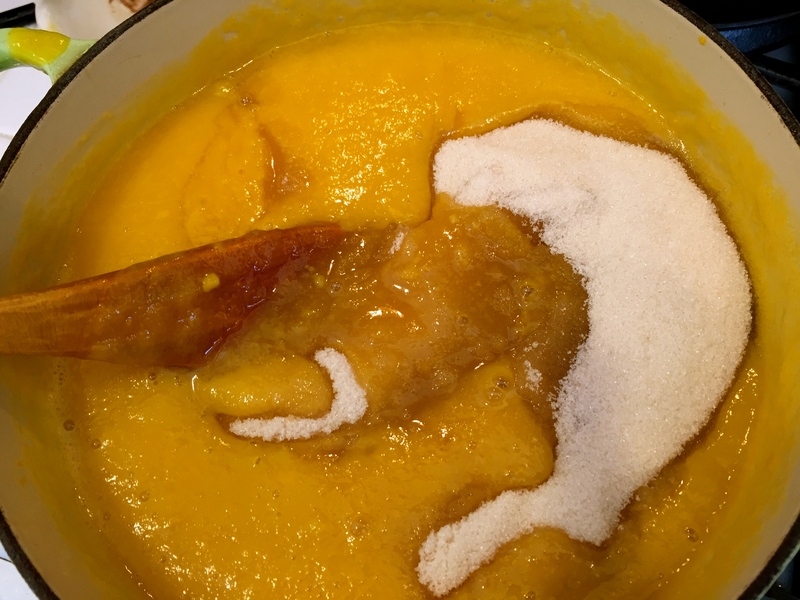 Then I added about 3 cups of sugar, and simmered it for another 30 to 45 minutes, until it was nice and thick. I let it cool for a while and then filled seven 8 ounce freezer containers. 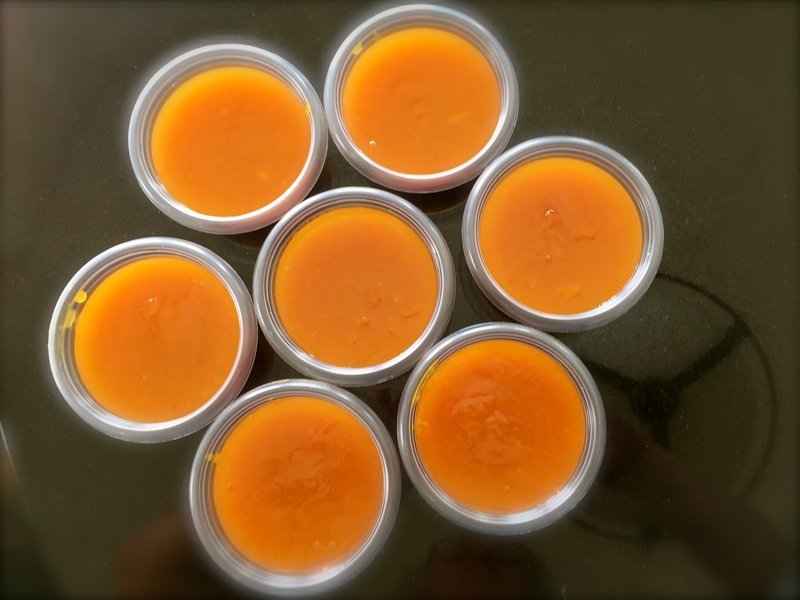 When the butter had cooled to room temperature, I sealed, marked and froze the mango butter. I’ve also made this recipe and canned it in a water bath. There are a number of variations online, but I’ve come to like this one best. Simple and not too sweet. I discovered the original recipe in a cookbook called “1,000 Mexican Recipes” by Marge Poore. Most of the recipes in this book, one would never encounter at a Mexican restaurant in this country. I’ve made many dishes from it, and never been disappointed. It’s a refreshing take on that cuisine. Since I try to eat mostly vegan, I veganized this bread. In a food processor blend the sugar and pecans until finely ground. Add the flour, baking powder, baking soda, cinnamon, and salt. Pulse a few times to blend. In a separate bowl mix the vegetable oil, vanilla, egg or cooled flaxseed mixture until well combined. Pour the liquid through the tube of the food processor and combine by pulsing a few times. 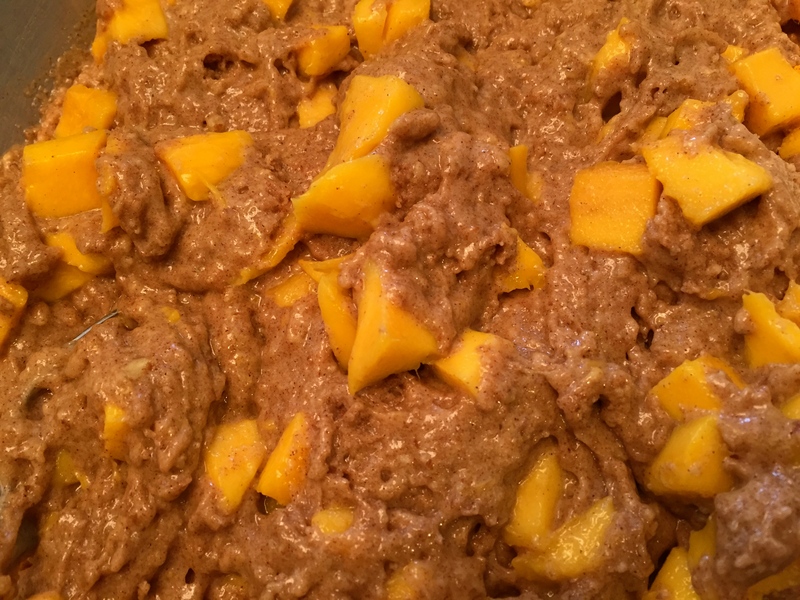 Then put the batter into a separate bowl and gently blend in the mango. Either bake in a well oiled 9 x 5 loaf pan or divide the batter between 2 smaller ones. Bake for about 40 to 50 minutes, or until a toothpick comes out clean. Let the bread cool for about 10 minutes before removing it from the pan. Leaving it overnight before cutting is best. I have made this, using hazelnuts and almonds. I have also used gluten-free flour with great results. You can reduce the sugar as well and it will still be sweet. During the summer I have used perfectly ripe peaches and apricots. This batter can also be baked as muffins, just preheat the oven to 400° and check them after 20 minutes. The nut bread looks delicious. I think I’m gonna try that one once our mango tree is mature enough to bear fruit. It’s easy to make and keeps well for several days. And it always disappears quickly! Glad you liked it. I’ll probably make some more with the rest of the mangos you gave me. Wow, that bread looks interesting! I love mangos! Right now I can’t really cook because we live in a tiny city flat without a functioning kitchen… but one day, when we move somewhere bigger (hopefully), I’ll have to come back to some of your recipes and try them out! This bread is probably my favorite. I always make extra and give some away. Mangos are my favorite fruit!